Micromax is going on launching new smartphones and tabs . Since it has become 2nd Largest Company in india to sell smartphone , Micromax has became 2nd Largest Indian Selling company , There are many reason why Indian People are going on buying Micromax Products . They are cheap , People gets Very high performances at there cheap rates , Indian Brand . Canvas 2 Colours or Micromax A120 Is the most awesomest Micromax flagship ever . It was launched in recent days and All the reviews in Flipkart are saying that its the best smartphone ever tried . And Because Micromax Canvas 2 Colours is available in several colours , this make it unique from others , People can buy their choice smartphone . Colours - And its obvious its unique feature include The colours thats why its named Canvas 2 colours . 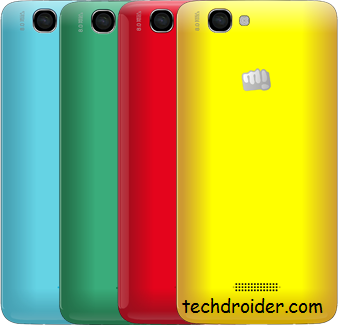 The Micromax Canvas 2 Colours comes with 4 user available colours . Actually the user will get three cover panels that is with grey canvas 2 colours user will get Mystic Blue and Radiant Red colour , And with white Canvas 2 Colours They will get Vibrant Yellow and Splendid Green Coloured Back panel . Screen- Canvas 2 colours has not got name due to colourful panels , it has also named due to high pixel quality of screen and vivacity of colours in the screen . Canvas 2 colours comes with 12.7 cm of IPS display that runs all apps and videos in HD quality . 16.7 m Colour depth . Processor - Canvas 2 colours has quad core Mediatek processor that has been clocked at 1.3 ghz with 1gb of ram that makes multitasking more easy and more amazing . User can experience full gaming experience without any graphic glitch and lags . Camera - Canvas 2 colours has amazing camera features that can be used by a photographer .It has a 8mp rear camera that can capture hd quality pictures and a 2mp rear camera that can take selfies and cool pictures . 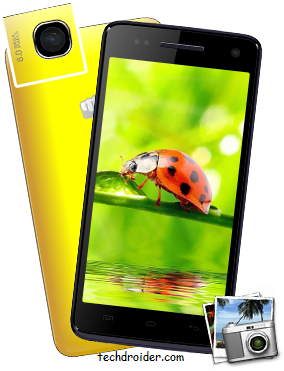 Other - Other features of Canvas 2 colours includes a 4gb internal storage with an expandable memory of 32gb . It comes with an android version of 4.2 jelly bean and can be upgradable to latest android version as soon the update will come . Miocromax A120 has a 2000Mah battery that can give a backup of one day . It has many sensors and many new preinstalled applications .